Quickly access information and tools related to your account. Depending on the user permissions, the user may see less options on this screen. 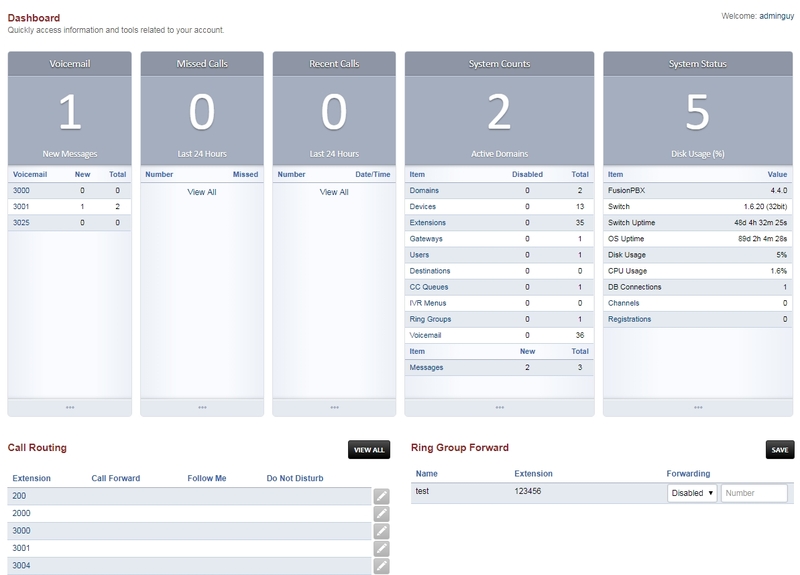 Voicemail: New and total voicemails related to the users voicemail box. A user can be assigned to more than 1 voicemail box. Missed Calls: Missed calls for the user. Recent Calls: Number of calls in the last 24 hours. System Status: Disk usage in percentage, FusionPBX version, FreeSWITCH version, FreeSWITCH uptime, OS Uptime, CPU Usage, DB Connections, Channels and Registrations. Call Routing: See if call forward, follow me, do not disturb is set and a quick wat to edit those options if needed. Ring Group Forward: See the name, extension number, if forwarding is enabled and what number it is forwarded to. System Counts: Number of Domains, Devices, Extensions, Gateways, Users, Destinations, CC Queues, IVR Menus, Ring Groups, Voicemail and if they are disabled.